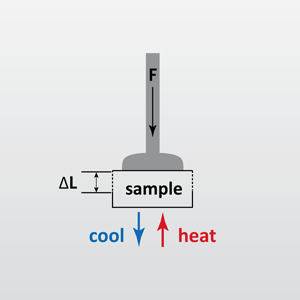 Thermomechanical Analysis (TMA) is used to characterize physical properties of materials when force is applied at specified temperatures and time periods. TMA is useful for investigating properties of viscoelastic materials, such as organic polymers. These materials exhibit both viscous and elastic properties that affect their response to mechanical stresses. For example, under conditions of ramping temperature under a fixed load, the viscoelastic material can exhibit changes in volume which correlate with changes in properties such as shrinkage, expansion, swelling, and softening.